Gallia Prosecutor Jason Holdren discusses the need for mutual respect in the world today. 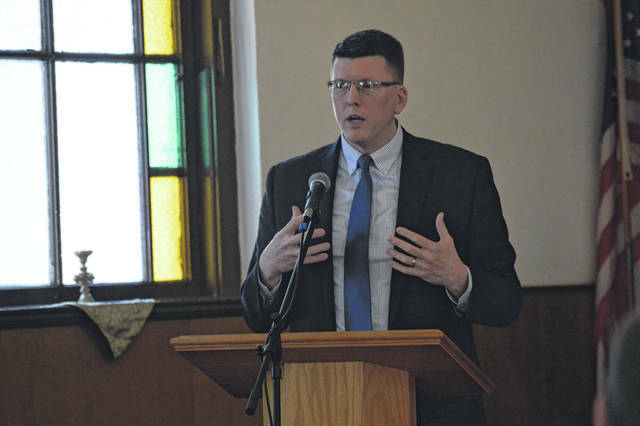 GALLIPOLIS — The Southeastern Ohio NAACP once again partnered with the University of Rio Grande and RSVP of Ohio Valley to hold a tribute to Dr. Martin Luther King, Jr., Monday, in Paint Creek Baptist Church. The NAACP of Southeast Ohio President Mabel Tanner served as mistress of ceremonies. The church’s Rev. Christian Scott served as pianist for the event. Rev. Dr. D.C. Carter of First Baptist Church in Burlington led the event’s invocation. Youth led the Pledge of Allegiance. The congregation joined in song to sing “Lift Every Voice and Sing.” NAACP First Vice President Kyle Gilliland gave a welcome for the event. Gallia Common Pleas Judge Margaret Evans also welcomed those in attendance along with URG Interim President Dr. Catherine Clark-Eich. Martha Cosby introduced area dignitaries and a musical duet was sung by Jaquar Brown and Linae Scott. Judy Payne introduced the day’s speaker, Gallia Prosecutor Jason Holdren. Holdren referenced a young man he was mentoring named Scottie Hughes, a River Valley High School graduate. Holdren said that Hughes had in the past had the opportunity to follow him and ask questions of various individuals across the discipline of law. Holdren built part of his message around Tanner’s earlier acknowledgement that while the country had come far in its treatment of others, it still had much to learn and do to accept and love others of different backgrounds. Holdren referenced the importance of sympathizing with addicts and those who walked a road battling chemical demons in places such as drug court, a program meant to bring lives darkened by substance abuse back to a manageable road. He also said that if those individuals would not choose to adhere to such program’s standards, they would likely find themselves in prison. Holdren mentioned another battle the community was facing, one built on suicide and overdose. He said in the last five years in Gallia, 66 had passed to overdose and 33 to suicide. In the US last year, the country lost over 70,000 to overdose. Holdren invited his oldest daughter, Rose, age 10, to the front of the church to share quotes and commentary about Martin Luther King. She detailed discussion once echoed by King about how Americans had unconsciously wandered away from God and become wrapped up in life, whether it was money, jobs or other conveniences in life. King’s words, echoed through the girl, said that money and cars were important to maintaining life, but one could not forget that such pursuits could not be a substitute for God, his love and the love of humanity.